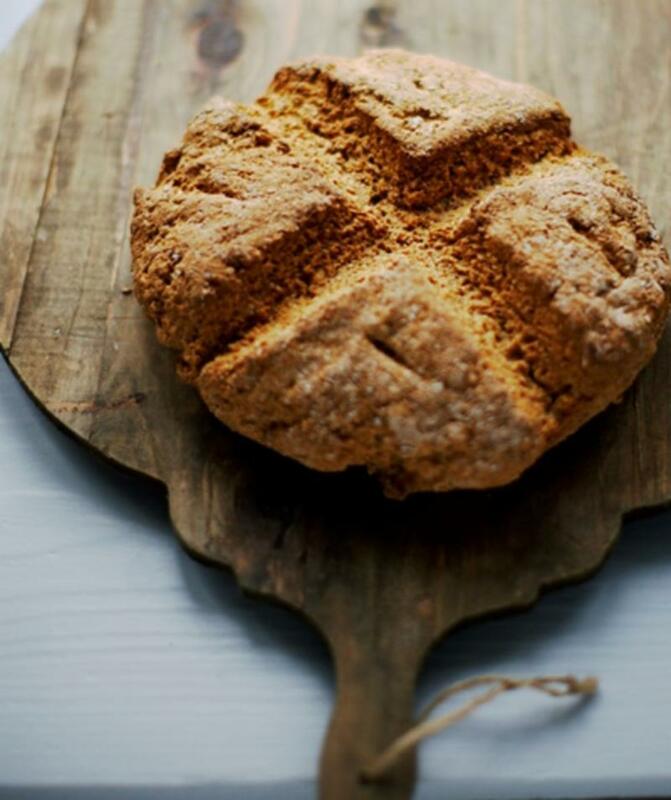 Lesley Keogh's Brown Soda Bread! This traditional bread is baked in kitchens across Ireland every day, and couldn’t be easier to prepare. Remember to mark the distinctive cross in it before it goes in the oven: it’s to let the fairies out, apparently. Mix all the dry ingredients together in a bowl. Make a well in the center and pour in the buttermilk Use your hands to draw the flour and milk together. Next, pour ingredients onto a floured surface and lightly form into a round (do not over-knead). Cut a cross on the top. Place onto a floured baking tray and put into the oven for about 35-40 minutes. When you take the bread out, turn it upside down and tap the bottom. If the bread sounds hollow it's done. Leave to cool on a wire rack. Serve with butter (Kerrygold is best!) or orange marmalade. If you have a suggestion to improve this recipe, just let me know. 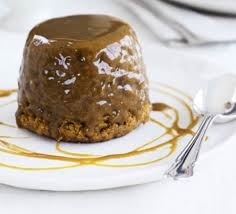 This sticky toffee pudding/cake recipe is easy to make, and freezes especially well. Preheat oven to 350°. Butter and flour bundt pan or ramekins. Cream together the margarine and sugar. Sift together the flour and baking powder. Beat the whisked egg into a creamed mixture with a little of the flour and baking powder and continue beating for about a minute before adding the rest of the flour/baking powder. Chop the dates and flour lightly. Pour the boiling water over the dates and mix in the baking soda and add the date mixture to the batter and mix well. Place in a buttered pan (or one lined with baking parchment) and bake for 40 minutes at 350F. Let cool in pan on a wire rack for 30 minutes. Invert pudding onto rack. DO AHEAD: Can be made 1 day ahead. Cover and let stand at room temperature. When the pudding is cooked, heat the brown sugar, butter and cream and simmer gently for 3 minutes. Poke holes in the pudding and pour the sauce over the pudding and place under a grill until it starts to bubble. Cut cake into wedges. Serve with sauce and with a dollop of whipped cream. For a real comforting winter warmer, try this delicious Wild Forest Mushroom Chowder from Kevin Dundon at Dunbrody House. 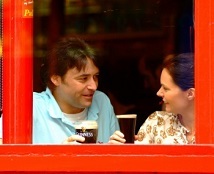 If you’re feeling adventurous, why not serve it in a bread bowl for added heartiness. Satisfaction is guaranteed. Heat a heavy-based pan and add the olive oil and a knob of the butter. Once the butter is foaming, tip in the onion, garlic and mushrooms and cook slowly for 4-5 minutes until tender but not colored. Take out and reserve some of the mushroom mixture to garnish. Add the wine to the pan and allow to evaporate until reduced by half, then season to taste. Add the vegetable stock or water, stirring to combine and bring to the boil. Reduce the heat and simmer for 15-20 minutes until slightly reduced and all the flavors have had the chance to infuse. Stir the cream into the pan and leave to simmer for another few minutes, then transfer to a food processor and whiz to a purée. To serve, remove the soup from the heat and whisk in the remaining butter. Season to taste and ladle into warmed serving bowls, then garnish with the reserved mushrooms and the torn flat-leaf parsley. Whisk all of the pancake ingredients together in a large bowl until smooth. Put a small knob of butter in a large non-stick frying pan over a medium-low heat and cook until melted and foaming. Pour 2 tbsp of the mixture into the pan and use the back of the spoon to shape into 4 inch circle. Depending on the size of your pan you may be able to get 2 or 3 pancakes to cook at the same time. Cook for 2-3 mins on the first side, then flip over and cook for another 1 min on the other. Heat oven to its lowest setting. Stack the cooked pancakes on a baking tray and keep them warm in the oven while you cook the rest. Softly beat the heavy cream with the powdered sugar using a whisk, then fold in half of the lemon curd. Mix the remaining curd with enough lemon juice to make it a drizzling consistency. 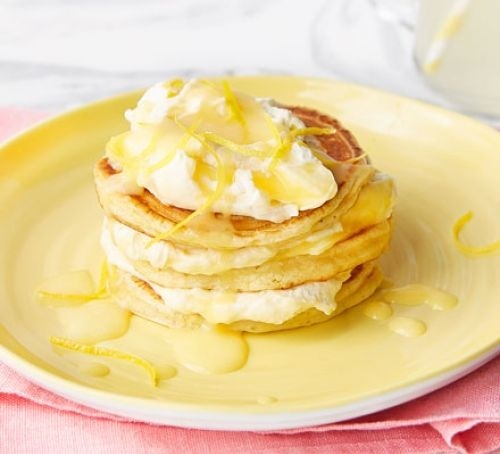 To serve, stack the pancakes with layers of the whipped cream in between them, drizzle with lemon curd, and scatter with lemon zest to serve.